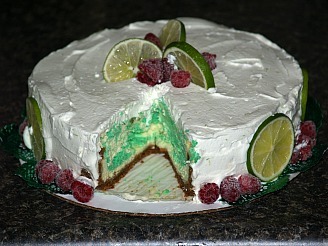 I first learned how to make key lime cheesecake recipe shortly after moving to Florida. This recipe reminds me of a delicious refreshing dessert for this warm climate. This could be that key lime pie is so popular in Florida gaining its name from the association with the Florida Keys. Unlike the regular lime, key limes are pale yellow in color therefore the original key lime pie or cheesecake is also pale yellow; some people add green coloring. I have been working on the massive number of cheesecake recipes which I have so I thought you would enjoy a delicious key lime cheesecake recipe. Key limes are small; a little larger than a walnut. They are much harder to grow than the normal green lime but if you have access to them they offer a lot of flavor to any recipe. When I learned how to make key lime cheesecake recipe and lime cheesecake recipes, I found that both are great summertime desserts. (This is not to say that they are not great any time of the year!) Both of these fruits are great flavor enhancers no matter how little you add to the recipe. They both can be used in all types of desserts as well as appetizers, soups, salads and entrees; great with fish and seafood recipes. Here are a few tips for when you are learning how to make a key lime cheesecake recipe or basically any cheesecake. Although various types of pans can be used typically a spring form pan is best having removable sides. If you are going to marbleize the cheesecake or fold in ingredients like chocolate chips or nuts, be sure not to overbeat the cream cheese. (This is important for all cheesecakes; overbeating causes the cheesecakes to crack). Avoid over baking the key lime cheesecake recipe; typically you might turn off the oven after baking until nearly set; then allow cake to set in the oven to cool with door open a little. If the instructions tell you to remove the cake from oven to cool, then you will want to cool it away from drafts slowing the cooling process down. During the cooling run a knife around the edge of pan to allow the cake to pull away as it cools. After cheesecake is completely cooled to room temperature gently remove sides of pan and refrigerate until cold. By following these simple tips and good recipes you can enjoy a delicious refreshing key lime cheesecake recipe in this summer heat. If you do not have a spring form pan, bake the lime cheesecake bars or bake the cheesecake in a 9 X 13 inch baking pan. They will still turn out delicious! NOTE: I used this first key lime cheesecake recipe to make a marble cheesecake. I wanted it to be a little special so this is why I chose to marble it. I wanted to give this dessert away therefore I wanted to be able to remove the cheesecake from my pan. I cut a circle of parchment paper to line the pan so I could slip a spatula underneath and move it to a disposable plate. After finishing the instructions for the mixing and folding in the egg whites, I measured out 3 cups of batter and tinted it with green food coloring. 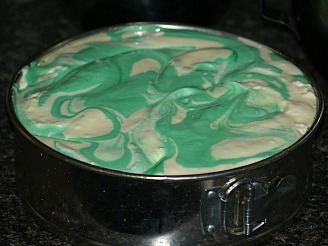 (If I didn’t want as much green, I would have only measured out 2 cups of the batter.) Because I wanted to frost with white whipped cream the green shows up better. When baking the key lime cheesecake recipe set it on a tray in the oven. I found that the butter from the crust ran through the spring form pan onto the tray. Part of the way through the baking, I wiped it from the pan to prevent smoking in the oven. After baking 40 minutes, I laid a piece of foil over the cheesecake to prevent more browning. After my key lime cheesecake recipe was refrigerated and cold, I frosted it with sweetened whipped cream, adding a tablespoon of grated lime peel. 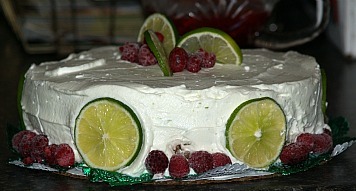 Then I decorated with lime slices and raspberries. I made the raspberry sauce recipe with lime to serve with it. After spooning the sauce onto a dessert plate, I set the cheesecake in the center. A wonderful dessert! You really do not need a sauce to serve with this recipe. It is one of the best recipes I have made. It is very moist and light from the beaten egg whites. Be sure to refrigerate 8 hours or overnight before cutting so it can set up. 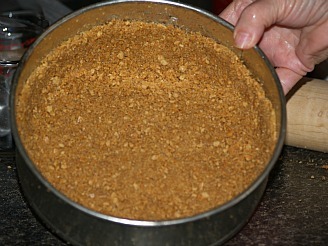 Combine cracker crumbs, ¼ cup sugar and melted butter. Press firmly in bottom and 1 inch up sides of buttered 9 inch spring form pan. Bake 8 minutes; remove from oven and cool on wire rack. Beat cream cheese until creamy on medium speed; gradually add 1 ¼ cups of sugar beating well. Add egg yolks one at a time beating well after each addition; stir in sour cream, lime rind and lime juice. Beat egg whites on high speed until stiff peaks form; fold into cream cheese mixture. Pour batter into prepared crust; bake 1 hour and 5 minutes. Turn oven off and open oven door partially; let cake set in oven 15 minutes. Remove from oven, immediately run knife around edge of pan to release sides. Cool completely in pan on wire rack; cover and chill 8 hours. Serve with choice of sauce. Combine raspberries and sugar in small saucepan. Cook over medium low heat stirring until sugar dissolves. Pour mixture through a wire mesh strainer into a bowl; discard solids. Stir in grated lime peel and lime juice. Process berries in food processor or blender until smooth. Stir in melted butter, powdered sugar and lime rind; mix until smooth. Combine chocolate crumbs with clarified butter; press into 10 inch spring form pan for crust. Beat egg yolks and 1 cup sugar to light lemon color and they fall in ribbon from beaters. Add the lime juice and 1 teaspoon vanilla; mix well. Beat cream cheese on medium speed until creamy; slowly add egg yolk and lime mixture. Pour into prepared crust and bake 25 to 35 minutes until center is set; remove and cool. Mix together sour cream, ¼ cup sugar and 1 teaspoon vanilla; pour onto cheesecake. Bake an additional 10 minutes; cool and then refrigerate until cold. Combine cake mix, 1 egg and oil; mix until crumbly. 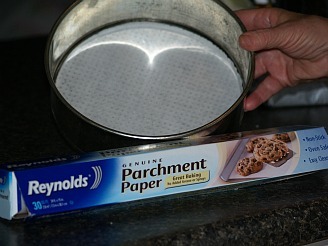 Reserve 1 cup of crumbs for topping; pat remaining crumbs into lightly greased 9 X 13 inch baking pan. Combine cream cheese, sugar, lime juice and 1 egg; beat until smooth. Spread mixture evenly over baked crust; sprinkle with reserved crumb mixture. Bake 15 minutes longer; cool and cut into bars. Reserve ½ cup of the dry cake mix. In large bowl combine remaining cake mix, 1 egg and oil. Press firmly on bottom and 1 ½ inches up sides of greased 9 X 13 inch baking pan. Beat cheese on medium speed until fluffy; gradually beat in sweetened milk until smooth. Add remaining 3 eggs and reserved ½ cup dry cake mix; beat 1 minute. Stir in lime juice, lime peel and vanilla; pour into prepared pan. Bake 50 to 55 minutes or until center is set; cool then chill thoroughly. Learn how to make key lime cheesecake recipe with lime juice and zest. Preheat oven to 300F degrees; lightly grease 13X9 inch baking pan. RESERVE ½ cup of dry cake mix; dump remaining mix in large bowl. Add ONE egg and oil to bowl; mix well (Will be crumbly). Press mixture evenly in bottom and 1 ½ inches up sides of prepared pan. Beat cheese in bowl until creamy; beat in condensed milk until smooth. Add remaining eggs and reserved cake mix; beat 1 minute on medium speed. Stir in lime zest, lime juice and vanilla; pour into prepared crust. Bake for 50 to 60 minutes until center is firm; cool to room temperature. Refrigerate cheesecake several hours until cold; spread Cool Whip over top. Cut into squares to serve; garnish with lime slices. TO MAKE CRUST combine and mix crumbs, butter and powdered sugar. Pat crust mixture in bottom of 9 inch spring form pan; refrigerate. TO MAKE FILLING beat canned milk until stiff; set aside. In large mixing bowl beat together cream cheese and sugar. Add gelatin to the cheese mixture and blend well. Add the whipped milk to cheese mixture; beat it altogether. Spoon mixture into cold prepared crust; refrigerate until set. Remove sides of pan to serve.